Agrarian Revolution research papers examine the Neolithic transition among human groups from hunter-gatherer societies into more settled farming communities. Agrarian revolution research papers document man's transition to an agriculturally based society. Paper Masters has many writers that are familiar with this topic from a sociological, agricultural, anthropological and geographical standpoint. Have our expert academic research paper writers produce you a model research paper on the agrarian revolution. 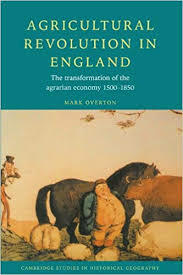 The Agrarian Revolution, also known as the Agricultural Revolution, was the Neolithic transition among human groups from hunter-gatherer societies into more settled farming communities. This transformation took place approximately 12,000 years ago, during the Holocene epoch. These were also major sites of agricultural settlement and the beginnings of civilization. Once settled, human beings began to selectively breed cereal grasses, the first of which were emmer, einkorn, and barley. These grasses were domesticated in the Fertile Crescent, followed by lentils, peas, chickpeas, and flax. Next came the domestication of animals. Dogs had been domesticated in the Stone Age and were used in hunting, but humans began to keep animals to be used as food, including sheep, goats, and pigs. Dromedary camels were domesticated for use as beasts of burden. However, along with the many benefits of settled agriculture, human societies became vulnerable to new diseases, perhaps resulting from inadequate sanitation from domesticated animals. Ancient Civilizations research papers examine when humans started making permanent settlements and brought on the agricultural revolution. Order a research paper from Paper Masters. Paper Masters writes custom research papers on Agrarian Revolution and examine the Neolithic transition among human groups from hunter-gatherer societies into more settled farming communities.